The meat-eaters of the world have a lot of corporate characters to look up to — Ronald McDonald, The Burger King, George Foreman... but my all time favorite has to be Bob's Big Boy. 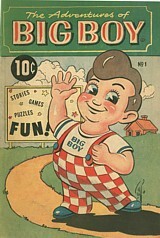 Big Boy also happens to star in one of the longest running comic book series in history. Click below to enjoy a classic from 1956.